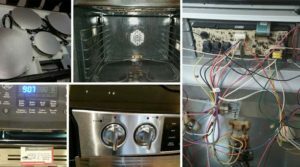 Same-day range stove or oven repair of all common makers. Convenient scheduling online and by text message. Plus, FREE house-call with your repair. Eating out can be expensive, so when your stove breaks down, you’ll want it repaired as soon as possible. 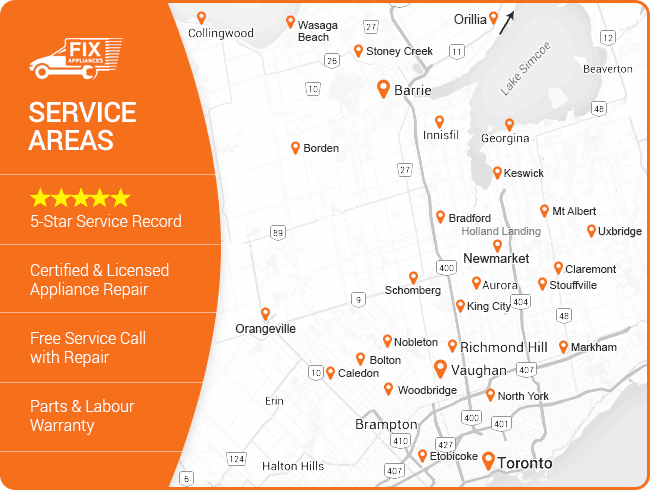 Skilled technicians at FIX Appliances CA can provide a quick and affordable stove repair in Barrie, Simcoe County, Toronto and GTA area, so you can get started on your next home-cooked meal. We offer convenient scheduling options by phone, text or online. FIX Appliances CA offers same-day service calls at no extra charge, so your stove can be repaired quickly. There’s no need to struggle with microwavable meals, call a skilled technician to take care of your problem today. Enjoy this special offer for your Range Stove or Oven Repair. Save $20 on Range Stove or Oven Repair For new customers only, for Range Stove or Oven Repair. The technician was friendly, diagnosed the problem and proceeded to fix it without additional parts or costs involved. Happy with the service and nice to have the oven working properly again! cover Simcoe County, Toronto and GTA areas. Check the map to confirm the service area nearest to your city or town. Each service truck carries an inventory of common replacement parts so your stove repair can be completed the same day. Should I broil with the door open? located in the bottom drawer, close the door. Can I heat my home with my stove? How do I get my clock to keep the right time? You may need to replace the clock if it gains or loses time as they cannot be repaired. What type of cookware can I use on a smooth glass cooktop? Stainless steel or heavy-weight aluminum pots with a flat bottom are the best conductors. Glass, ceramic and cast iron cookware is not recommended. Why are my electric surface burners not heating? Check the circuit breaker and power cord to be certain your stove is getting power. If only one coil burner doesn’t heat, plug it into another receptacle. If it still doesn’t work, it may need to be replaced. Carefully clean the control panel with a non-abrasive cloth and mild detergent. The door panel and glass should be cleaned when completely cool with a heavy-duty degreaser. Smooth, glass stove tops should be cleaned with a scratch-free pad then a special cooktop protectant should be applied. Clean up spills as soon as possible to prevent smoke during cooking. 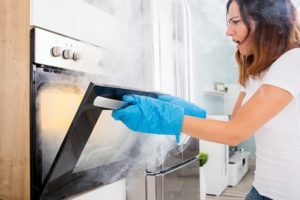 Non-self-cleaning ovens can be cleaned with a heavy-duty oven cleaner. Self-cleaning appliances use high temperatures to bake off food particles and usually takes between 2 and 4 hours. Use an inexpensive 40-watt appliance bulb inside your stove. Some models may require that you remove a glass cover to reach it. The racks can be removed and cleaned in the sink. Soak in soapy water to loosen food particles and spills. Remove racks before using the self-cleaning feature to avoid warping. The porcelain-coated broiler pan can be cleaned with a non-abrasive cleaning product. Replace the pan if it becomes damaged or chipped.